Two fire cases were spotted in East Jakarta yesterday night until Thursday (4/19) morning. Investigation is still underway to find out the exact cause of the fire.
" The fire in Pasar Rebo area, the loss is reaching Rp 800 million"
The first fire was at Jalan Lebak Sari, RT 06/02 Cijantung, Pasar Rebo, East Jakarta, at around 9-10.15 PM. Three homes were burnt and four persons had burns and rushed to the hospital. The second fire was at Jalan Raya Setu Cipayung, RT 08/05 Cipayung Urban Village, Cipayung Sub-district, at around 1.15 AM. It was allegedly triggered by electricity short-circuit. "The fire in Pasar Rebo area, the loss is reaching Rp 800 million. 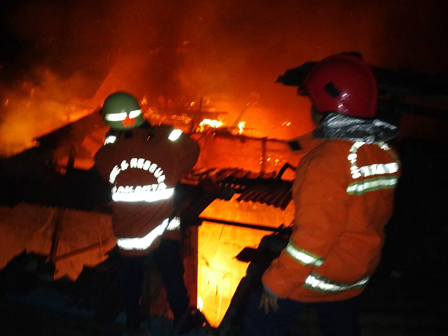 So far the case is still being handled by the Pasar Rebo Sector Police," said Gatot Sulaiman, Section Head of East Jakarta Fire and Rescue Sub-dept., Jalan Lebak Sari Cijantung, Thursday (4/19). While in Cipayung, the fire destroyed a 4x4-meter store. Temporary allegation, it was caused by leftover tiner stored in the warehouse. "No casualty reported here, yet the material losses reached Rp 50 million," he told. To put out the flames, nine fire trucks were deployed to the scene. Within one hour, they managed to handle the situation. This case now is still handled by the Cipayung Sector Police.